Pottery Mark Query - AR or JR or IR on Quatrefoil Cup and Saucer:- I'm sorry I don't have any interesting story to tell re: the history of this mystery cup and saucer. I only just purchased on the internet (here in New Zealand) and I'd love to know a little bit more about it if possible. It's definitely been through the wars, glued up, and well-loved etc so I don't remotely think I have an heirloom on my hands! But I'd love to know if this hails from France or Germany, 18th or 19th (or 20th!) century, etc, etc. Any thoughts would be greatly appreciated! Nice photos and nice story too, thanks for sharing. What could be nicer than someone trying their hand as a china antiquer. You also come from one of the best cities in the world (my sister normally lives there, but is back in England for a while). Now, as you know, I am no expert and don't pretend to be, but I like to 'sniff out' stuff which is genuine and possibly worth something. something very high quality and 'right' about the whole thing, the colours, the shapes, the design integrity and the mark. There is a big possibility this could be a clever fake of course (the fake itself could be an antique in its own right - and quite valuable) but it could well be the real deal - a Meissen mark from the period 1720 to 1760. The mark is actually AR (named after the Regent Augustus Rex). Normally these things are in museums, so what it is doing floating around NZ I have no idea. There were a few notable 'reproduction' studios around at the time like Samson of Paris and Helena Wolfsohn. If you draw a blank on your own research, you may be in need of an expert. If you do decide to got this route, please consider my service as I would like to find out as much as you. If so, just fill in the form on this page:- vintage and antique china values where you can take the opportunity to liaise with experts without fear of paying for nothing, as the experts are employed by and responsible to this website. Hope you are as excited as me. Helena Wolfsohn had a porcelain decorating business which used a wide array of blanks from different other companies. From 1879 onwards the business also frequently copied the 'A.R.' (Augustus Rex) mark which had been registered by the KPM in Meißen. The year the business started to use the 'A.R.' mark is known because the KPM instantly appealed for court intervention and in this case it took until 1883 before the studio was forced to stop using that mark. Instead of stopping to use the mark, it was changed slightly all the time as to make it more difficult for the court to decide; ie: an 'A.R.' mark with an arrow pointing upwards is one of the examples used around 1880. Interestingly enough it was not Helena Wolfsohn herself who copied the marks as the business had been taken over 1878 by Leopold Elb and W.E. Stephan who kept the name of the studio but nearly instantly ran into trouble. As they continued the use of the mark after the inquiries had started the court did not only decide they had to stop any use of that or similar marks but also ordered that they had to compensate the KPM for the use of their mark. This ruined both partners and the business was closed at the end of 1883. In general, the more prized the product by a certain manufacturer, the more likely it is that the makers mark has been imitated at some time or another. However, it is also important to remember that even the most prestigious porcelain manufacturers were, to some degree, considered imitators in their own day. Some 18th century Meissen pieces, for example, bear Oriental designs or features, and are even painted with fake Chinese or Japanese marks! The now-famous Dresden artists were, in their day, considered to be Meissen imitators and some decorators, such as Helena Wolfsohn or Carl Thieme, even faced lawsuits brought against them by the Meissen Royal Manufactory for their use of deceptively-similar marks. Even so, pieces by Helena Wolfsohn that bear the fraudulent "AR" monogram are highly prized today, and the works of the Dresden studios have since seen their fair share of imitations in the last hundred years. Great researching! Thanks for taking the time and trouble to write this up for us! That's what this website is for. Useful info for us all to learn from. There are a few points that should be remembered when dealing with porcelains bearing AR (Augustus Rex )marks : 1. The AR mark on Meissen is rare. Not uncommon, not infrequently seen but RARE. Most dealers, even specialist dealers, will never handle a genuine AR marked piece of Meissen; 2. The rare AR mark on Meissen was very rarely used on teawares ( ie, cups and saucers. ) 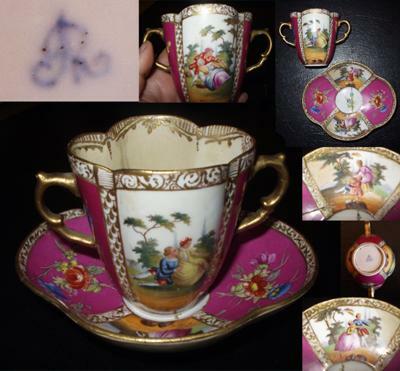 Therefore genuine AR marked Meissen cups and saucers are VERY rare; 3.It is a fact that the Helena Helena Wolfsohn decorating establishment used a version of the AR mark ..... but only for approximately two years ..... and for the later part of that time they used a distinctive variation; 4. If the Helena Wolfsohn establishment produced the number of AR marked cups and saucers accredited to them they would have been incredibly ( UNBELIEVABLY ! ) busy. You have to remember that the Wolfsohn establishment was based in a house - just an ordinary street house - and a great deal of the lower floor was dedicated to their retail shop premises. As a generous estimate, not more than 10% of the cups/saucers bearing the AR mark were actually decorated by the Helena Wolfsohn concern ....... In reality that figure is far lower. The Helena Wolfsohn company copied the Meissen AR mark ..... and in turn have been copied extensively by other companies ever since. A great many of those copies were produced in Dresden .... and a great many more in the far East, particularly Japan, in the 1960s. 5. Most of the cups and saucers in this distinctive shape and style of decoration are quite crudely decorated with printed scenes. The original Helena Wolfsohn pieces were hand painted to a high standard. Interestingly, in this particular instance, I can see why Peter`s nose is twitching because this cup and saucer appear to be very well decorated and although I am unable to confirm an attribution to Helena Wolfsohn because the photographs are just not of adequate quality, I wouldn`t be surprised if they are, in fact, by the Helena Wolfsohn company.